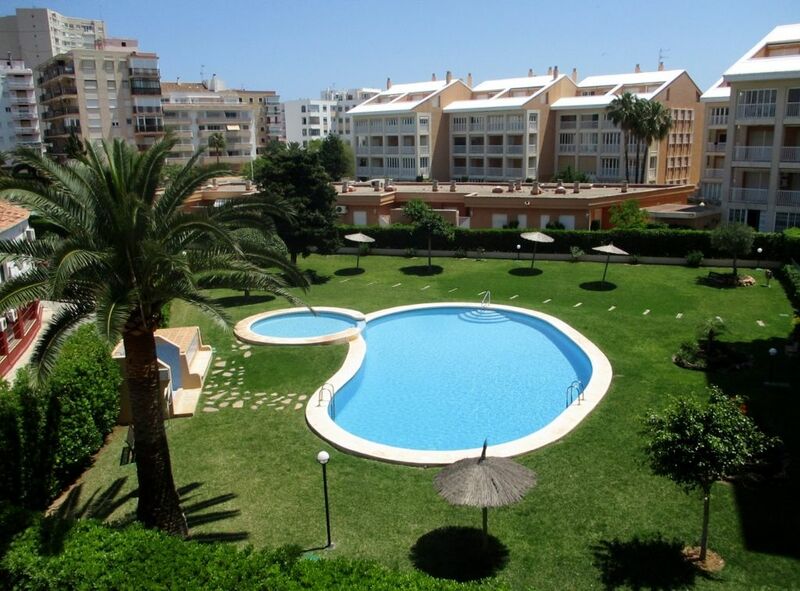 Apartment enjoys views of the large pool, children’s pool and lush grass covered gardens. We are a family run company in Jávea on the Costa Blanca in Spain. Our services vary from apartment rental for temporary visitors to property maintenance for local residents. If you would like further information, regarding our Apartment Rentals, Villa Rentals or our Villa Management Services, please contact us via email or telephone. Casa Tamarits is a recently renovated, modern, attractive apartment, on the second floor of a popular community; located on Javea’s famous Arenal beach area the apartment is only a 1 minute walk to the lively bars, restaurants, nightclubs and attractions, and guests also have easy access to Javea’s famous “Chiringuitos” (Beach bars) which are only a short 15 minute walk. The apartment enjoys views of the large pool, children’s pool and lush grass covered gardens from the balcony terrace. The apartment is made up of 2 large bedrooms, first a king-size master and a second with 2 single beds. The apartment also benefits from a modern, well equipped kitchen ,open plan dining area and lounge, as well as 2 separate bathroom suites. The apartment entrance is protected with door intercom and has a lift to all floors; the terrace enjoys al fresco dining for 4 with wonderful views. The apartment has free Wi-Fi for guests use and also has UK satellite TV channels. Managing your villa helps you to solve all those problems you get when you have left to return home. There are always phone calls from Telefónica, Repsol and especially alarm companies, etc. We are here to arrange an appointment and see them at a convenient time and take the pressure off of you while you are here on holiday. Some of these things may not be convenient to be dealt with while you’re here or may just occur whilst you are back home. Having someone to deal with this for you is priceless. We are also able to undertake maintenance or building alterations , as well as deal with any electrical and plumbing issues. We have used the services of Jávea Beach Rentals now for several years and what a fabulous business they are. We live in the U.K. and have a holiday home in Jávea and we have used various businesses over the years. However Darren and Phyll provide us with and outstanding service and they are consistently reliable and professional! No matter what the problem is they have always been there to support and advise. I travel alone quite often with my children and my husband joins us later in the holiday. I feel safe knowing that Jávea Beach Rentals are always only a call away. They do an amazing job and are very loyal and committed to provide a service at very competitive rates. We are fortunate to have found them and needless to say we don’t ever have to look anywhere else as with Jávea Beach Rentals there is always a solution ! We had the pleasure of spending a lovely holiday in this spacious, beautiful flat in June 2016, following its refurbishment, which has been carried out to a very high standard. There is a bath with shower, which makes it ideal for families with younger children. The furniture, equipment and accessories were all brand new and tastefully chosen. There is every piece of kitchen equipment anyone could require. The balcony overlooks the well-kept gardens and swimming pool. The flat is situated a few minutes’ walk from the beach, which can be seen from the kitchen and second bedroom windows, there is also a vast array of shops, bars and restaurant, all only a few minutes’ walk away. The area is wheelchair friendly and there is a lift to the first floor. 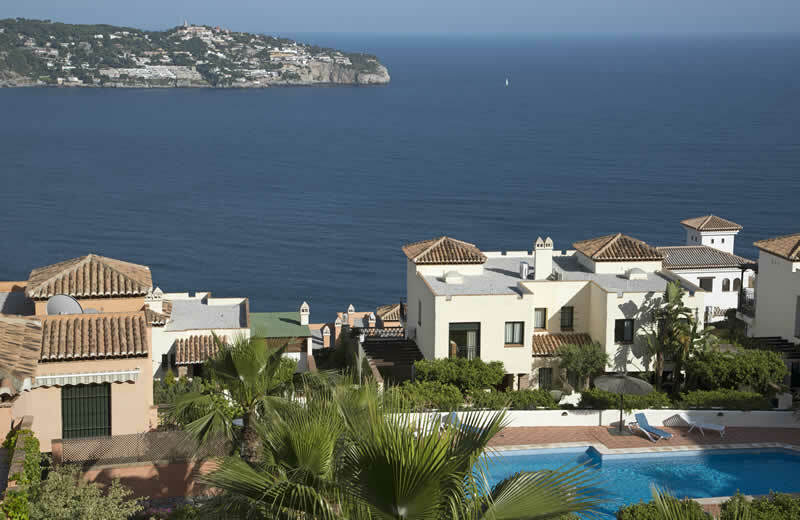 Javea is a beautiful place with lots to offer all holiday makers from sightseeing to relaxing. I would recommend this flat to anyone. We have known Darren and Phyl for over 15 years and during this time they have been responsible for the maintenance of our holiday home in Benitachell . This work includes the pool, garden and cleaning all of which has been carried out to a high standard. Additionally from time to time they have also undertaken various building works for us involving decorations, repairs and improvements again to the same high quality. Not only are Darren and Phyl pleasant to deal with they are professional, honest and totally reliable. We have no hesitation in recommending them to anyone in need of the services they offer. In July we were lucky enough to choose this apartment from the many available. We were travelling with our two teenage daughters, 15 and 17, so hard to tick all of our requirement boxes. The apartment worked wonderfully for us all, it’s close proximity to Javea’s lovely sandy beach, shops and restaurants (about 100 meters away) gave us peace of mind while our daughters ventured out by themselves. The apartment itself, recently renovated, is decorated in a modern style with a fully equipped kitchen with laundry area, all brand new. It has views to Montgo Mountain and the Arenal beach. There is a large balcony with table and chairs which is more than enough space for breakfasts and dining, this overlooks the communal pool and gardens which were beautifully maintained this also has another access to the Arenal beach. Although its close proximity to the beach we found the apartment very quiet and was able to have a relaxing stay with the peace of mind that everyone was independent and happy. We would definitely recommend this apartment for a young family or a relaxing break. It definitely ticked all of our boxes.